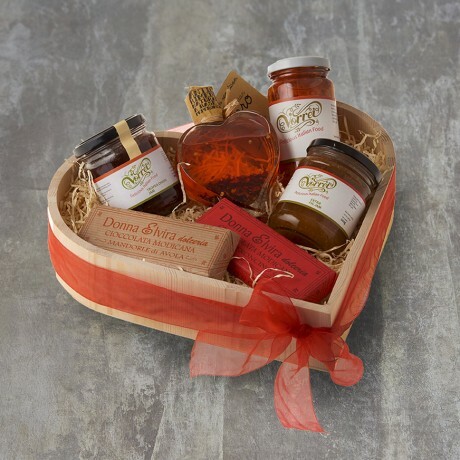 The Aphrodisiac Delights heart hamper makes a fun gift! This lovely wooden tray is filled with some of our most popular products, all of which are reputed to have aphrodisiac properties! Your recipient can turn up the heat in the kitchen and have fun creating some tasty Italian dishes with these fabulous ingredients! Tropea onion jam (200g) Serve with cheese or meat, spread on a bruschetta or perhaps in a savoury tart. These sweet Tropea onions are said to be such a strong aphrodisiac that during the time of the Greeks, priests were banned from eating them! Chilli pepper paté (212g). This explosively spicy spread will liven up your bruschetta or could be stirred into a tomato sauce to give your pasta a real peperoncino kick. Chilli peppers increase heart rate, help to release endorphins and give you energy! Chilli Infused 'Viagro' Extra Virgin Olive Oil (100ml). Made from some of the most potent chillies you will find in Calabria, this chilli infused oil can be added to pasta, rice, meat and fish dishes, pizza and bruschetta! The producers call it an 'ancient aphrodisiac remedy' and advise that it should be 'taken every day' to gain maximum benefits! Extra fig jam (200g). A fabulous fruity jam which is equally good on toast as with cheese such as Brie, Boursin and Goat's cheese. Loaded with minerals such as zinc and magnesium, figs have a range of health benefits and have long been considered an effective natural aphrodisiac. Chilli pepper Modican chocolate (100g) and Almond Modican chocolate (100g). Our dairy free chocolate is made from an ancient Aztec recipe and in fact the Aztecs were the first to draw a link between the cocoa bean and desire! Dark chocolate in particular is though to be an aphrodisiac - our chocolate bars are flavoured with chilli pepper and almond, both of which have aphrodisiac properties too! We carefully wrap each product inside the hamper and then cover the tray in cellophane and tie with a lovely red ribbon. A gift message option is available. Nuts, almonds, milk, eggs, wheat, soy. May contains traces of othre nuts and sulphites.